I finally climbed up to the top of Castle Peak this week after 15 years of having a cabin here on the summit. I know, all you old timers are thinking “what a tenderfoot”. It’s funny how every year I planned to do it and every year something happened to prevent it. My chief requirement was that the weather and visibility be perfect because I didn’t want to miss the great pictures I’ve included here. There were years where we had forest fires mucking up the visibility. Other years there were other hikes to do. But this year I made it my top priority and last week we had the perfect day for it. We climbed the west shoulder route up the the west turret. I know the east turret is the highest, but we are only talking a few feet. 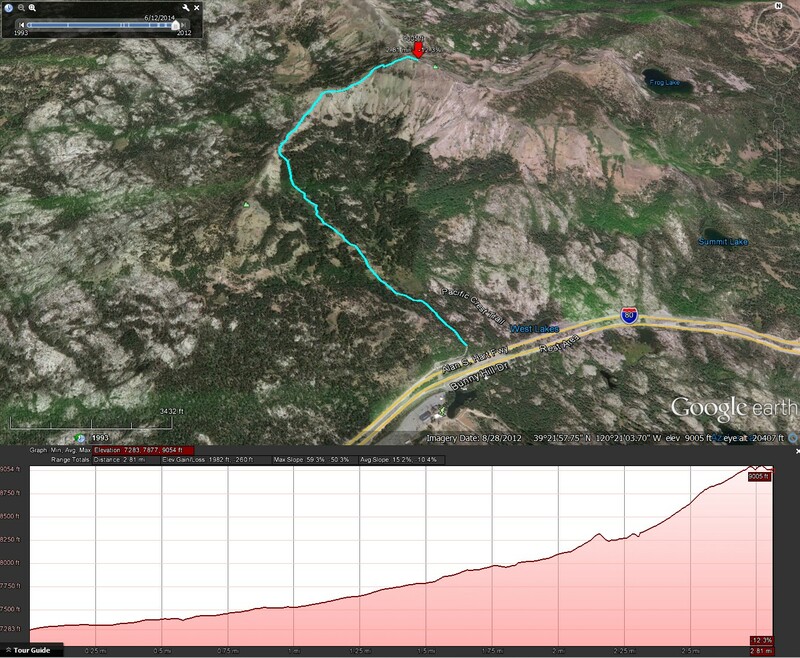 As you can see from the trail map below, the climb is all up. Since we did it this early, the Forest Service hadn’t opened the gate yet and we had to walk the extra mile or so versus parking farther up the road when the gate is open. The route is pretty easy to follow up the west ridge approach. We hit a couple of small patches of snow but nothing we couldn’t handle. I highly recommend that if you haven’t done this climb, you should. The view is probably the most spectacular on the summit. If you’re going to do it make sure you watch the weather and pick a good clear day with very little wind. Like any good climb it gets steeper the closer you get to the top. Just keep putting one foot in front of the other and you will be rewarded with spectacular views.